YOU’LL BE HOOKED. FOR LIFE. WE LOVE TO RUN IT. WE LOVE TO LIVE IT. WE ARE PROUD TO SHARE IT. Have you always wanted to be one of the brave (but slightly mad, let’s admit it!) runners who frantically race before a herd of massive bulls through the narrow alleys of Pamplona? Are you looking for a way to experience the pulse of this unique festival without facing the bulls? 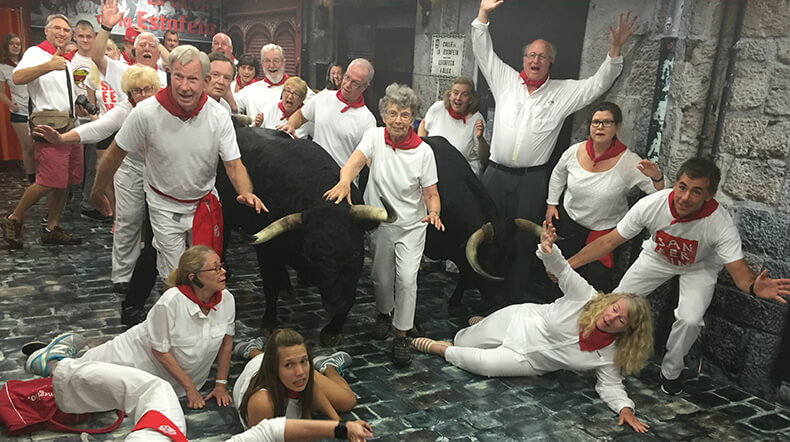 From the ground or from a balcony above, let those of us who are born and bred in Pamplona, show you how it’s done. Your adrenaline through the roof with the locals to back you up! Francisco was awesome and the location was one of the best along the bull run! You will NOT be disappointed with the location of his balconies. There were 8 of us in total and he was able to accommodate all my friends and I on a single floor. We had the 2nd floor balcony and it was the best view, I would not change anything about it! He also serves a light breakfast for you so be sure to arrive a little early so you can enjoy some time chatting with everyone and catching up with Francisco on the history of San Fermin and the Bull Run. Do not pass up one of his balconies, you will regret it! The reviews were what sold me on reserving with Francisco and boy were they right! Fantastic balcony location along the Bull Running route. Awesome! Everything was fantastic!!! BEST view ever! If you’re having any second thoughts about booking a balcony for the San Fermin Festival, you absolutely do not need to think twice about booking with Fran. It is exactly the type of experience you want to have when you watch the Running of the Bulls. We went on the last day of the festival and had no trouble finding the place. Fran was easy to contact and very communicative during the entire process. He was readily available to answer all questions we had before and during our trip to Pamplona. This balcony was located right off of the main square – so we had views of “the encierro” on one side and views of the square on the other. The view was exceptional and we had unobstructed views with comfortable and more than ample space. Snacks were abundant (coffee, cheeses, pastries, meat) and everyone was so friendly! Fran had great recommendations in the city for us, as well, and made us feel right at home. The Secured Seal in this website confirms this is a secure platform where you can safely book your San Fermin experiences and purchase your entries/tickets. Trust us!